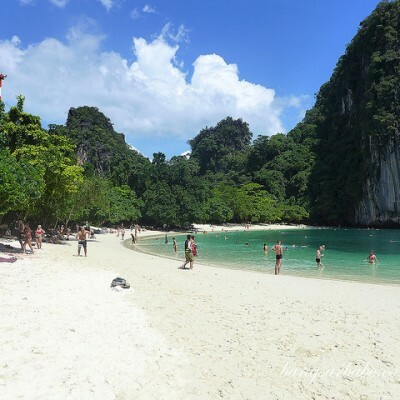 When I visited Bangkok for a very short trip (literally 36 hours! 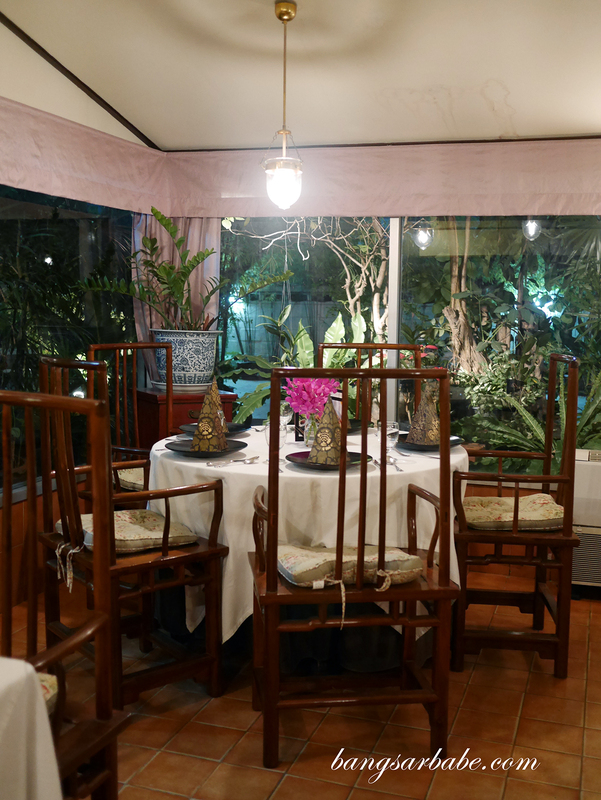 ), Jien took me to Thanying Restaurant for a dinner date as he read that this is one of Bangkok’s best fine dining Thai restaurants. 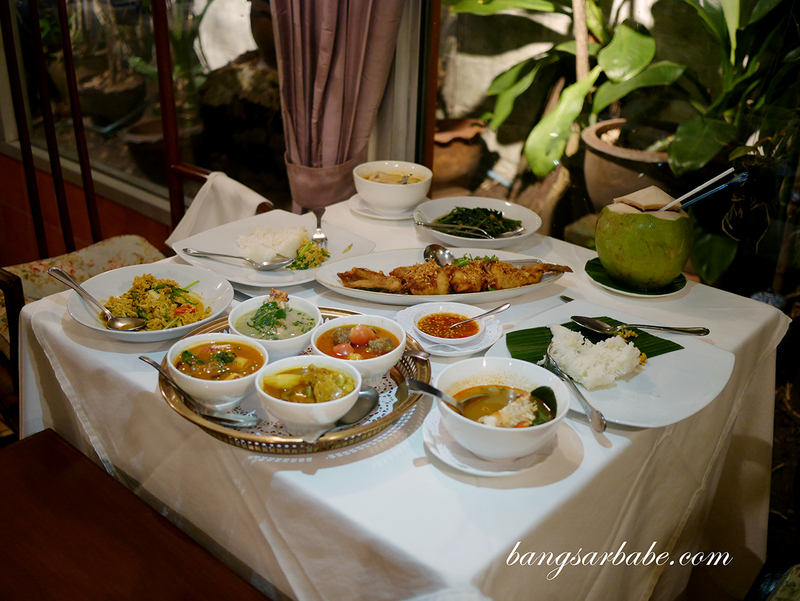 We made reservations to play safe as it’s hard to predict the F&B scene in Bangkok. 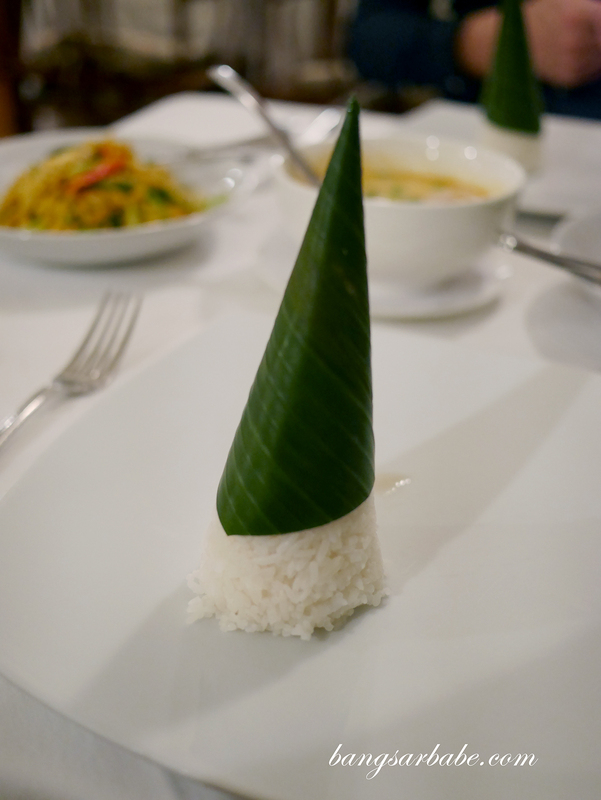 We actually lost our table at Mandarin Oriental Bangkok the night before because we couldn’t get transportation. 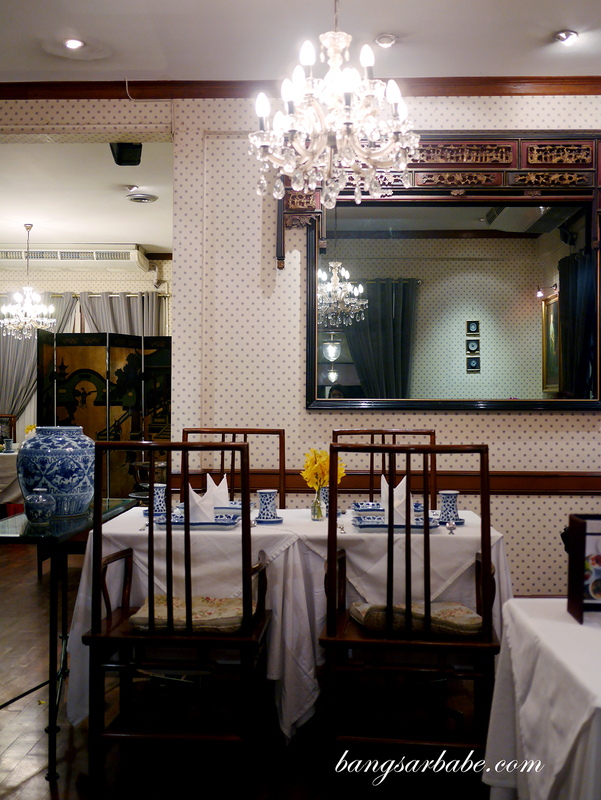 There’s a bit of old world charm at Thanying – the décor and setting made us feel as though we were dining like royals. Service was very good; we were greeted at the door, immediately seated upon confirming our reservations and throughout the night, the staff were attentive and accommodating. Jien and I went all out, ordering whatever that tickled our fancy that night. 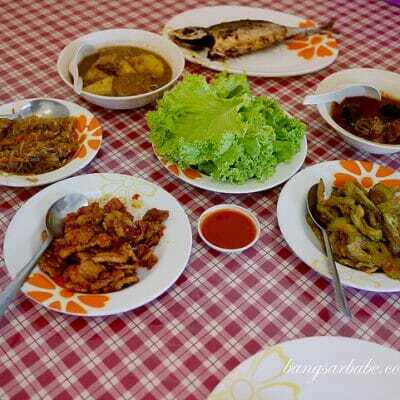 We ordered a set of four kinds of curry (THB 480), tom yam goong (THB 180 per person), tom kha gai (THB 160 per person), pak pa boong (THB 140), nuer poo pad phong ga hree (THB 320) and pla ga-phong sarm ros (THB 495). A massive spread for just two pax, I know. Food was really good. I was particularly impressed with the sea bass (pla ga-phong sarm ros), where the fish was deboned, deep fried and topped with fried garlic bits. This was served with sweet sour chilli sauce on the side. 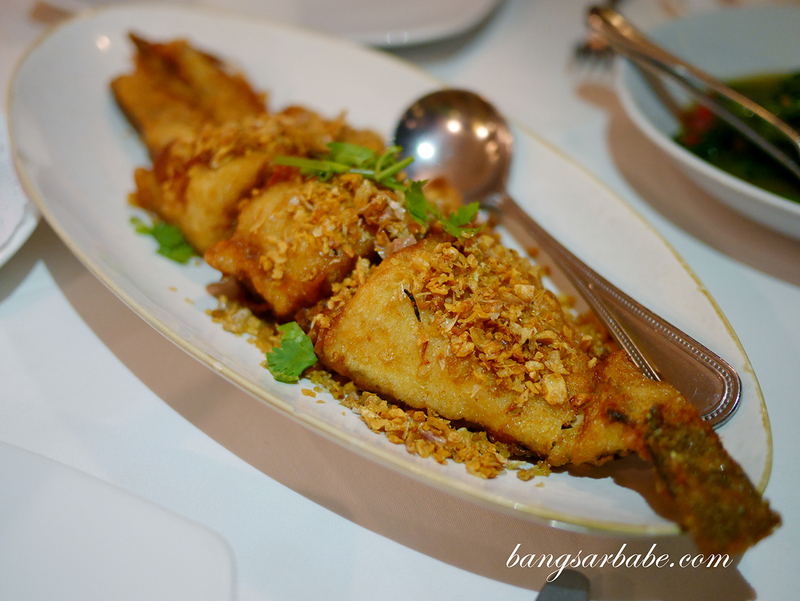 The fish was fried just right, retaining a moist texture and accentuated by the robust flavour of the chilli sauce. 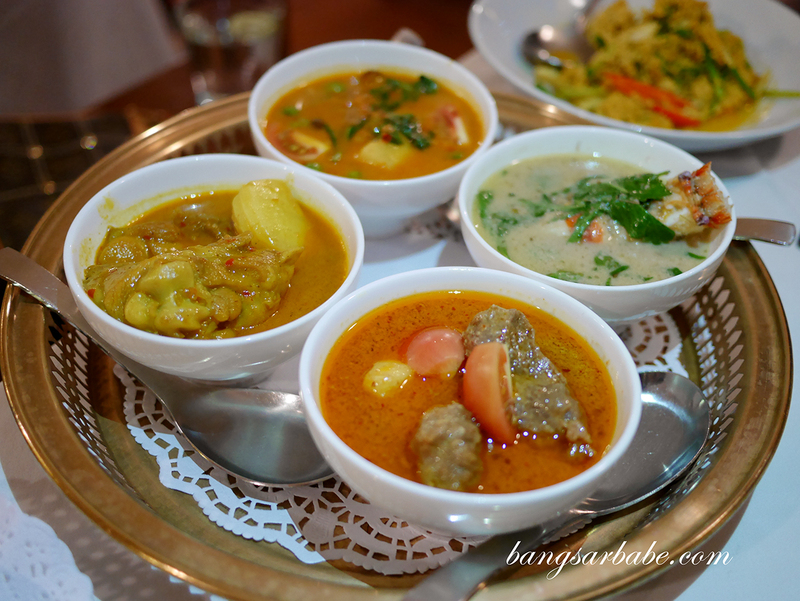 I also enjoyed the set of curries – we were served sweet massamam beef curry, sweet chicken curry, prawns in green curry and roasted duck in red curry. All were good in their own way, and I particularly enjoyed the roasted duck curry and chicken curry that night. To a point I asked for extra rice. 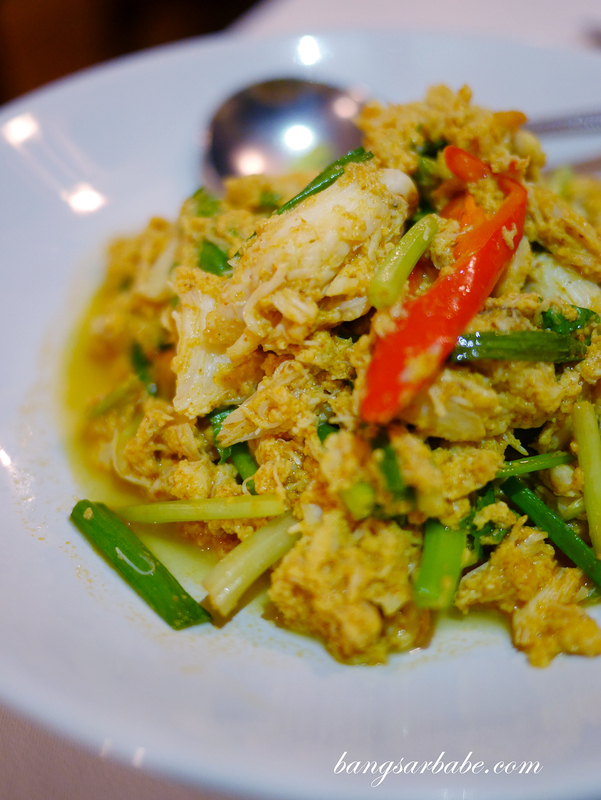 The crab meat with curry powder, egg, milk, roasted chilli oil and celery (nuer poo pad phong ga hree) was good stuff. This was rich in flavour from the eggs and milk, with spicy undernotes and terrific aroma. I also liked how the squid was cooked till tender so the texture was crunchy and creamy at the centre. 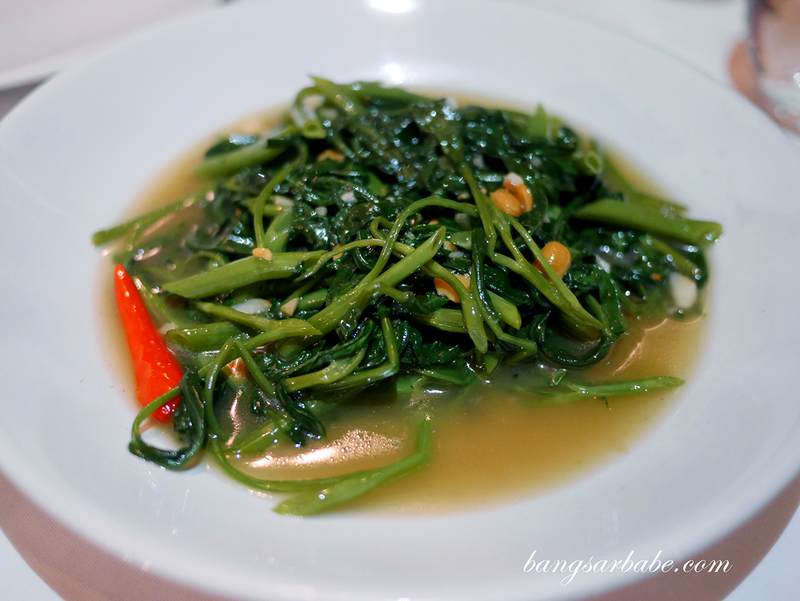 While the morning glory may seem unassuming, Thanying does it quite nicely where you get a nice amount of wok fire and umami flavour from the use of soy bean sauce. 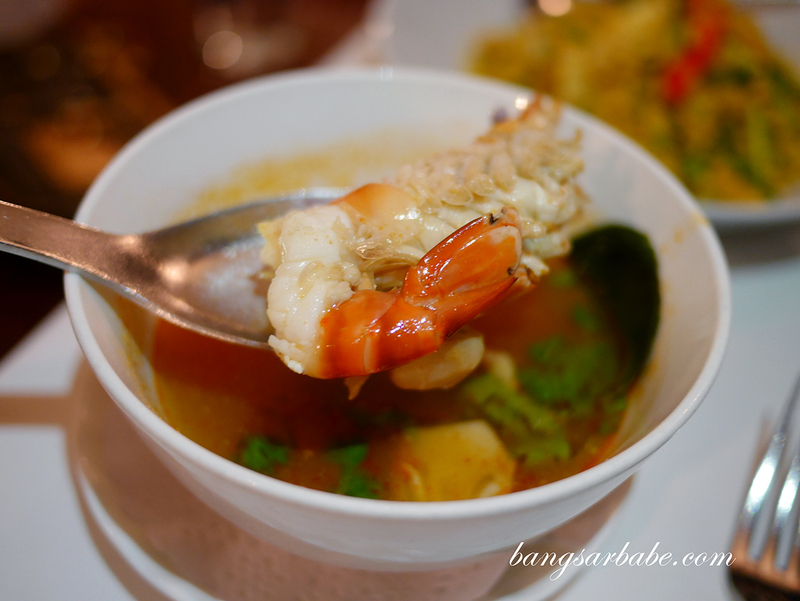 Tom yam goong is something I have to order whenever I’m in Thailand, and at Thanying, this is served clear yet robustly flavoured. 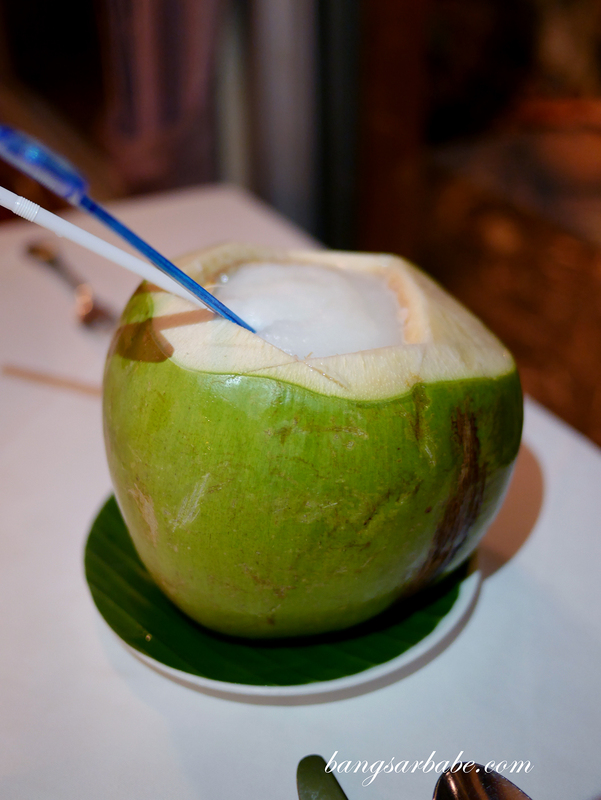 You get a lot of sweetness from the prawns, and sharp, tangy notes from the lemongrass, tamarind and lime. 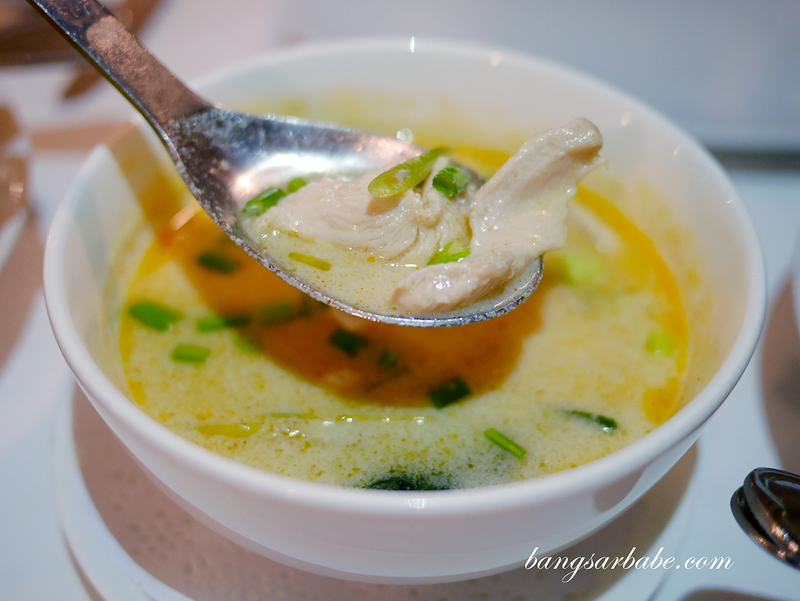 I liked the tom kha gai better – a hearty, tummy warming broth of chicken in coconut milk soup, accentuated with galangal, lemongrass, lime leaves and a zest of roasted chilli. 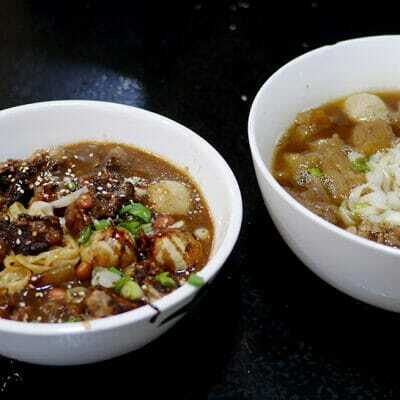 Personally, I liked it better than the tom yam goong as I’ve always been a fan of creamy broths. 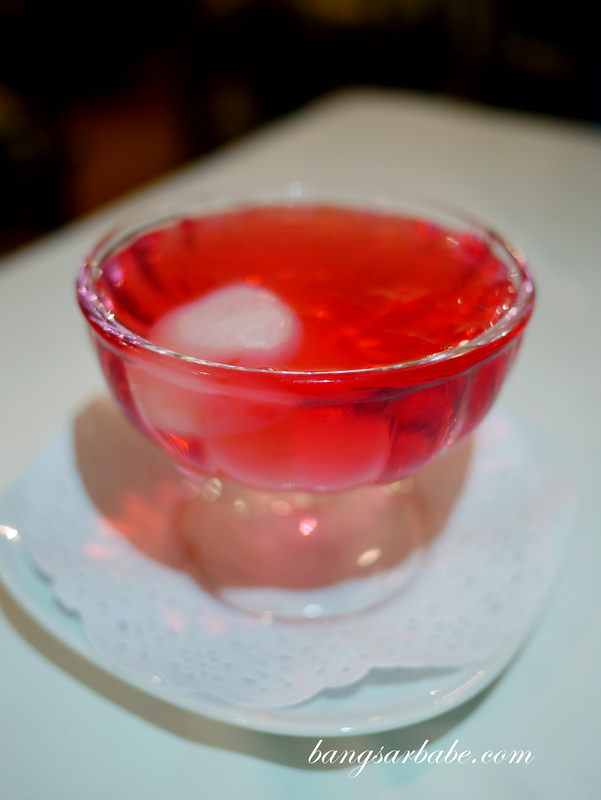 Jien ordered “jelly” for dessert (THB 60) which I suggest you skip as this tasted no different from what we can find at supermarkets. Our bill came up to THB 2000 for all the above, inclusive of two non-alcoholic drinks. Pretty good value for money considering the food, ambiance and service. Verdict: Almost everything we had were delicious! BTS: 3 mn walk from Surasak BTS Station.